A solid semi-auto blaster, if you like the aesthetic. Today’s the day! 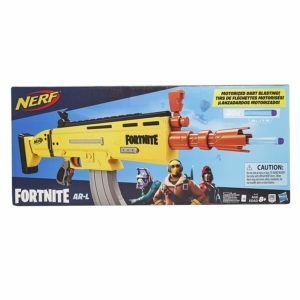 The Nerf Fortnite blasters are finally in stores. As such, we’ll start with the big one, the AR-L. At $50, it’s a bit expensive for what is essentially a remodeled Stryfe. 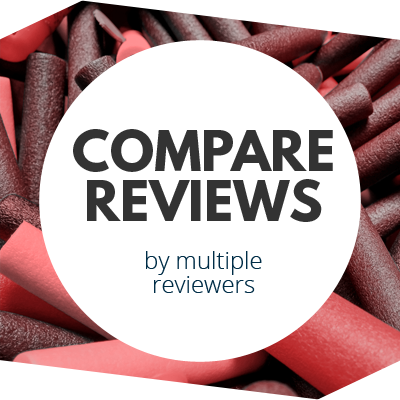 Even so, it has the performance you’d expect in a fun package, making it a nice option for both fans of Nerf and of the game. 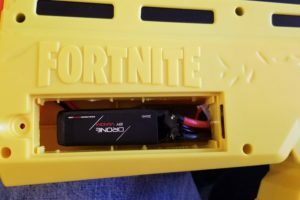 The Fortnite AR-L comes in a long, thin box, complete with the cartoony look you’d expect. It includes a ten dart “banana” magazine, 20 darts, and the blaster itself. With the exception of the single tactical rail on top of the blaster, it’s not compatible with any Nerf accessories. And since the blaster has the oversized sights on top, the usefulness of that tactical rail is a bit questionable. The blaster itself has the solid feel you’d expect from a Nerf blaster. It’s a boxy thing, but that’s part of the appeal of Fortnite, after all. Realism isn’t the end goal here. The grip is on the smaller side – okay for children, but adults with larger hands might not like it. The same thing applies to the stock – it’s smaller, and I find it comfortable, but it probably won’t be for everyone. Blaster operation is typical – 4 AA batteries go in the tray (at the front of the blaster, in this case). The jam door must be closed and a magazine inserted in order for the blaster to power up. It’s pretty standard at this point when it comes to Nerf blasters. And it does take all standard Nerf magazines, not just the included one. The AR-L gets pretty typical performance for its class. Darts averaged 62fps out of the barrel. Being semi-auto, you can fire as fast as you can pull the trigger. 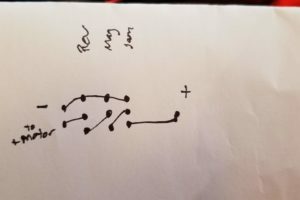 Realistically, if you want dart velocity to be usable, you’re limited to about three darts per second. Blaster usage, however, is impaired by the large, cartoonish design. For one thing, the top rail angles up compared to the plane of dart travel. So looking down the rail, sights flipped down, ends up pointing the blaster farther down than desired. In addition, using the sights is extremely hard, due to their large size. I found it much easier to point and shoot than to try and aim at targets using the sights. I get that it maintains the aesthetic, but it does make a difference in using the blaster. 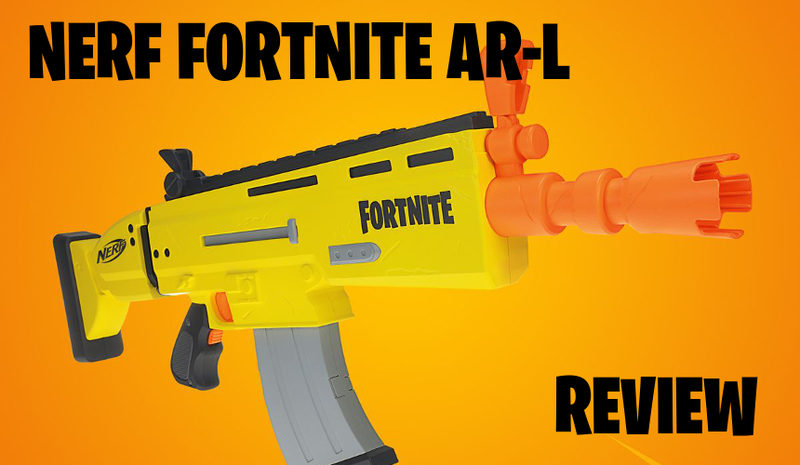 The Fortnite AR-L is a nice flagship for this cross-promotional blaster line. $50 is still $50, but if you have the money and like the looks of the blaster, it’s a solid performer. 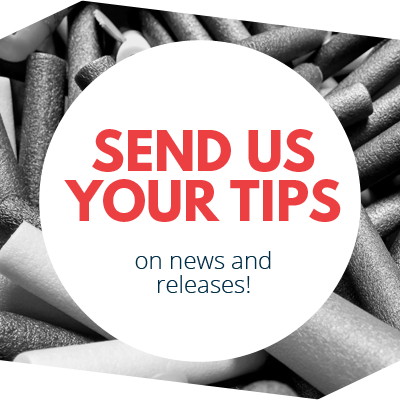 There will just be things here that some people won’t like (grip, stock length, sights, etc), and others will. The flywheel cage, with the usual circuitry. 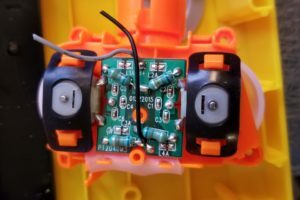 There's a small board under the dart pusher that all the switches plug into, with the default position being the top two contacts on each switch. All must be depressed for current to reach the motors. It also means every switch brakes the motors if released. So much space for activities! I maintained all stock wiring, just using it to trigger a MOSFET to power the flywheels. I simply removed the battery tray. 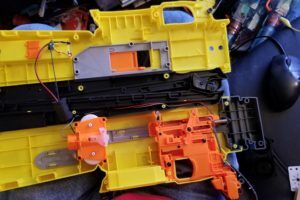 At last, we’ll look at the insides of the blaster – since this is for hobbyists looking to tinker, I try not to let this bleed over too much into the general review. But in terms of potential, the AR-L has a ton. The front of the blaster has a huge amount of open space. You can, of course, use that for a battery and basic rewiring. But I’m sure there will soon be blasters with two or three flywheel cages crammed into this space. If you choose to replace the flywheel cage, aftermarket cages for the Modulus ECS-10 will fit the mounting pegs. However, there are a few plastic ridges that will need trimmed in order for it to fit properly. 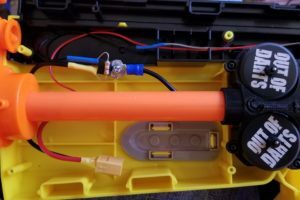 This entry was posted in Dart Blasters, Reviews and tagged 2019, blaster, blaster hub, elite, fortnite, hasbro, nerf, review, toy fair on March 22, 2019 by BuffdaddyNerf.